Inspired by her experience helping her own parents age, Margo Arrowsmith wrote You Can Keep Your Parents at Home to help others facing similar situations. In it, she details her L.O.V.E. 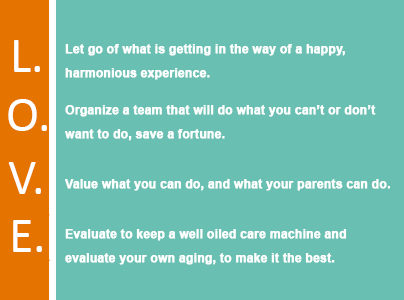 system and how it can spell out how to best to care for your aging parents or other family members without sacrificing your own financial and emotional well being. Margo shares stories of her own parents aging to illustrate the highs and lows of family members aging in home. To purchase You Can Keep Your Parents at Home, please click here.